Can GPS make the Census better? Census Bureau is using GPS-equipped handheld computers to verify addresses. But a costly snafu forces agency to return to paper for follow-up. Census workers used GPS-enabled devices to verify addresses. Are homes affordable where you live? Yes, thanks to the housing bust. No, they're still too pricey. NEW YORK (CNNMoney.com) -- The Census Bureau is breathing a sigh of relief after a problem-plagued project to go high-tech recently cleared a big hurdle. 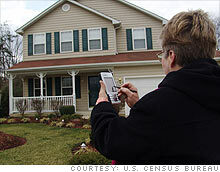 Census workers are finishing up the agency's first use of GPS-equipped handheld computers to prepare for the 2010 population count. Instead of fanning the country with maps, employees used the devices to update the bureau's master address list of 145 million residences. Though some experts feared technological breakdowns in the field, early reports say the handhelds worked well with just a few glitches. Some 140,000 workers were able to finish checking addresses in early July, a few weeks ahead of schedule. But not all went so well with the bureau's leap into the computer era. Census had hoped to use the $600 million system from Harris Corp. to follow up with those who don't respond to the six-question Census form next spring, when the actual counting begins. Major technological problems, however, forced the agency to return to the paper-based method, which is less efficient and accurate. This last-minute switch, announced in April 2008, could cost taxpayers up to $3 billion through fiscal 2013, according to the U.S. Government Accountability Office. The increased price tag reflects the additional time and manpower the paper-based method requires, as well as added supplies and systems. "It really could have assured greater accuracy and it could have cut costs," said Phil Sparks, co-director of The Census Project, a watchdog group made up of government, professional, research and civil rights organizations. "There's no question the Census squandered hundreds of millions of dollars." The 2010 Census is expected to cost up to $14.5 billion in total and is expected to employ 1.4 million people, the vast majority of whom will be hired next year. The bureau's GPS saga began in 2006, the bureau hired Harris Corp. (HRS, Fortune 500), based in Melbourne, Fla., to develop 151,000 handheld computers equipped with GPS software, as well as the technical infrastructure to support the count. The company provides radio, wireless and other technology to corporations and government agencies, including the Pentagon and the Federal Aviation Administration. The computers offer many advantages over the former system, which involved sending workers out with maps to find and plot residences. The GPS system is more accurate in pinpointing homes and allows those in the field to electronically update the list if they find new dwellings or abandoned buildings. In rural areas, the technology can assist workers in finding homes. "A lot changes in 10 years," said Mary Jo Hoeksema, director of government affairs for the Population Association of America, which represents demographers and social scientists. The technology also helped better identify which Census tract a home is in, a crucial fact in determining an area's representation in Congress and the distribution of more than $435 billion in federal funds every year. Until now, the Census Bureau usually puts about 5% of residences in the wrong tract. With the GPS, it is aiming to reduce that error rate to 0.5%, said Daniel Weinberg, assistant director for the decennial census. As for how the Census Bureau's first GPS effort worked, the agency says it must verify the recently collected data before passing final judgment. For its part, Harris said it was pleased with the computers' performance and noted that it also provided data processing and networking services to the agency. "The handhelds are one only aspect of the significant technology modernization efforts the Census Bureau asked Harris Corporation to help with," said Marc Raimondi, a spokesman for the company. The Census Bureau last year had to jettison a major part of its plan for the handheld computers after problems arose during field testing. The plan was for workers to visit each household that didn't respond to the 2010 Census and use online forms to collect the information. They could then have transmitted the data wirelessly to the bureau, eliminating the time and errors associated with collecting and scanning paper forms. In initial tests of address verification, workers encountered problems with slow data transmissions, freeze-ups, and insufficient capacity to handle data in densely populated areas. Concerned that just correcting the handhelds' problems with address canvassing would take a lot of time and effort, the bureau decided to abandon using the devices for following up with non-responders. "It just didn't work fast enough," Weinberg said of the computers. So the agency went back to its standard paper-based method for following up with non-responders. Workers next summer will visit each home and either fill out the questionnaire at the time or encourage residents to complete it and mail it back in. By not doing this step electronically, the bureau is missing the opportunity to streamline its operations, said Hermann Habermann, a former deputy director of the Census Bureau. If workers had handhelds, they could more quickly receive updates on which residences have mailed back forms and more easily send back the completed online forms. "The whole process becomes more efficient and [the agency] gets the information more quickly," Habermann said. The agency is now working to set up the costly paper-based system, and some observers fear that it won't have enough time to properly execute it. Following up with non-responders is the most expensive and labor-intensive piece of the decennial count. Still, this should not compromise the quality of the data collection, experts said. "They know the work that needs to be done," said Robert Goldenkoff, director of strategic issues for the Government Accountability Office. New Orleans: Fastest growing city in the U.S.